Home » events	» Urban Craft Uprising is THIS WEEKEND! That’s right, it’s that time of year again! If you’ll be anywhere near the Seattle area this weekend, December 4th, 5th & 6th, I’m going to heartily recommend you plan whatever you’re doing around attending the Urban Craft Uprising‘s 11th Annual Winter Show. This is truly the most extraordinary indie craft show around, for a myriad of reasons. There are tons of fun prizes and events going on both days — swag bags, hourly giveaways, over 150 incredible vendors, with special bargain $10 items offered by most of them, a very special Preview Shopping Night, plus, each hour there are book signings by crafty authors, and special extended hours for this winter show. If you need to knock some gifts off your list this year, this is the place to do it! 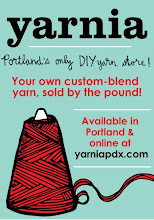 Oh, and of course Yarnia will have a booth, bursting with new yarns for you to marvel over, and an overflowing Bargain Basket to boot. Come say hi! Friday, December 4th | 5pm – 9pm | TICKETS ARE LIMITED! Visit us at Urban Craft Uprising!